by Georges Arsenault, translated by Sally Ross. It is my great pleasure to introduce an important new study to you. But first, a confession: I am an insider, a devoted mummer of the English variety. Christmas doesn't begin for me until I hear Father Christmas come crashing through a pub door, demanding "room, room, room I do declare." But I am also an academic so any interest of mine goes through the wringer of literature searches and critical studies. I have learned to sift the wheat from the chaff. This new book satisfies almost all requirements. For those one or two of you who are new to the word "mumming", or sometimes "mummering", imagine a house-visiting custom that is rough-and-ready street theatre, performed during seasonal high days. It can be as intricate as a musical drama with song, narration and dance, or as simple as a Halloween dress-up, but they all share the same ambience of folklore celebration and community bonding. The performance is stuffed within a short span of time, followed by a quick bit of merrymaking with the host, then on to the next performance venue. It is, or was, common in England, but it is also found around the world in indigenous or English post-colonial variation. I am also a passionate Canadianist, primed to discover any transplantations that make their way to our shores, often resulting in some great cultural hybrids. It certainly did not take me long to discover the rich tradition of English mumming in Newfoundland. My introduction came from Chris Brookes and his affectionate theatrical revivals performed on the streets and in the homes of St. John's Newfoundland, and documented in a whimsical book entitled, "A Public Nuisance", published in 1988 (See Filewood, 1998, 2002, and Nothof, 2009). This tantalizing first taste was followed quickly by a study of some of his sources, notably Halpert and Story (1969), Sider (1977) and Margaret Robertson (1984). All that interest may be 30 or 40 years old now, but even as recently as 2007, scholars and enthusiasts were still jigging the deep waters of Newfoundland mumming for insights and anecdotes (see Palmer & Ponianek, 2007). 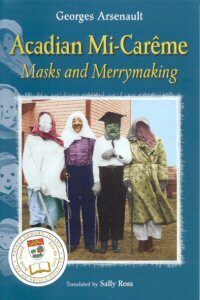 And lest this fascination with Newfoundland mummers gets way too serious, forgetting that its all about having a lark with some friends and taking the mickey out of one or two of the hosts, one can do no better than read "The Mummers Song" by Bud Davidge (1993). The book is best appreciated by reading it aloud to a young child while sharing in the excellent illustrations by Ian Wallace and secretly wishing that you lived in that rural, rose-tinted past. So the appearance of a book-length study of another mumming tradition in Canada is a special and completely unexpected pleasure. The custom is called Mi-Carême, or just Carême, and it is found among the francophones of Acadia, but not among the Quebecers, interestingly. Aside from the usual markers of mumming, it has one particularly unique trait. It is performed half way through the forty days of Lent. The only other high day I know that is associated with this half way point along the difficult road of denial and sombre reflection is the old English Mothering Sunday (not to be confused with Mother’s Day - the second Sunday in May in North America). Both celebrations are a reflection of institutional catholic sensibilities. But only Mi-Carême recalls the riotous behaviour at both ends of Lent, Mardi Gras and Easter, when social safety valves harmlessly release themselves. Another curious feature of Mi-Carême is its dual yet related traditions. On the one hand, it is a time for a typical troupe of players to march from house to house in gaudy clothing. But it is also an occasion for the annual visits of a bizarre mother figure, also dressed in disguise, also travelling from family to family in search of hospitality and in some cases, youthful recipients for her moralizing and retribution. Although the mother in old English Mothering Sunday, and the matron of Mi-Carême are seemingly different kettles of fish, one cannot help drawing a mysterious parallel between the use of the word "Mother" in both settings, despite being quite different in application. Freud would have loved it. The author is Georges Arsenault, and a perusal of the book's bibliography (and the Web) shows us that he is a long-standing scholar of Mi-Carême in particular, and Acadian folk culture in general, particularly in the province of Prince Edward Island. Almost all of his writing is in French which may explain why his studies have not circulated widely in Anglophone Canada. This monograph is translated from French (Arsenault, 2008) by what must be his long-time collaborator, Sally Ross, who has assisted him in other publications. The gold sticker on the cover, proudly announcing that the book is a recipient of the Prince Edward Island Book Award/Prix du livre, means that I am not alone in my appreciation of this newfound knowledge. I had already got wind of the custom of Mi-Carême when I read an article I had stumbled across in Canadian Geographic (Mar./Apr. 1997, pp.62-67). The travelogue text and vivid colour photos described the tradition in an isolated island community called Île aux Grues, in the mouth of the St. Lawrence River, very near Quebec City. Now the tantalizing aside I found in Caroline Perry's school book, "Let's Celebrate: Canada's Special Days" (1987, p.74) made a bit more sense. A quick look at the online version of the Canadian Encyclopedia today reveals a terse description by Nancy Schmitz. But it is still an unknown custon, as seen in the definitive source for online folk play research, England's Traditional Drama Research Group, within Chris Little's compilation, "Folk Play Links – Canada". Now we have a full explanation. As befitting a first book-length treatment of a new subject, one finds abundant scholarship, catalogued with profuse and detailed footnotes (but no index, sorry to say). Historians and ethnologists whose profession demands a certain level of scepticism and a desire to see the proof of the pudding will be pleased with the huge variety of second-hand documentation and first-hand accounts. There is no lack of detailed maps and even the songs of Mi-Carême are recorded in music notation. Before diving into the deep stream of information, however, I recommend jumping ahead to the three-page sidebar on pages 106-108 to soak in the warm and nostalgic waters of affection felt by its players. Then, as you work your way through the book you will be impressed by the historical continuity that allows you to see a custom evolve, sometimes in a disorderly fashion, but always in response to the needs of each period of history. Having declared the book as definitive, I do not mean to suggest that it is the final word. Folklorists will have a field day placing the custom in larger contexts. The most obvious place to begin is Newfoundland, and indeed, we find the same fascination with disguise, even to the point of making it the focus of a game of recognition between the host and the players. However, comparisons are there to discover even further afield. Students of English customs will think back on E.P.Thompson's descriptions of Rough Music (a.k.a. Charivari) as they read Father Bourgeois' 1888 account of the general noise and rowdiness that accompanied the young men as they stormed into homes with their "gift" of disruptive and joyous behaviour (pp.27-30). As one reads about the details of the motherly side of Mi-Carême and her rough-shod behaviour, especially towards children, the Italian Le Befana (the Strega Nona of Epiphany) comes to mind. But the most vivid comparison must surely be the Ukrainian Malanka. Unlike the female Mi-Carême, or so it seems, the boisterous Ukrainian and Ukrainian-Canadian female (impersonator) is always in the company of the mummers, as their leader, no less. The author's repeated descriptions of the interaction of children and the Mi-Carême deserve further investigation as well. Children between six and ten are regularly subject to terrifying experiences in the home, or at least, terrifying to them. "Who's afraid of the big bad wolf?" declares the reading parent as the tiny son or daughter lies quaking in their night-time beds, enraptured and repulsed at the same moment. I must admit that I am not familiar with the relevant literature about children's horror stories, although I would start with "The Uses of Enchantment" by Bruno Bettelheim. Even then, as a parent I recall the anxious conversations among fellow moms and dads when we discussed enacting scary scenarios for our children under controlled situations. Be that as it may, the fear that children experienced during the visit of the mummers reminded me of the same concern, vividly recalled in another issue of Canadian Geographic, this one dating from 1993 (Nov/Dec) where the author, Ray Guy, described his childhood terror when the Newfoundland pole-horse intruder, the Jannie, and his gang of "keepers", or rather, fellow miscreants visited his family's kitchen. We on the West Coast are familiar with the native tales of the evil female Tsonoqua, who snatches children away from their parents if those children wander too far from home. Tsonoqua is also portrayed in a kind of folk drama, but at traditional Potlatches, much to the delight and horror of the attending children. There are other examples too numerous to mention now. Allow me to share one final discovery with you. I was fascinated to read about a well known dilemma among those who have revived or maintained their mumming tradition: what is to be done when there are too many mummers and not enough homes for mummers to visit? In England, home visits have largely been abandoned in favour of pubs, but among the Acadians, home-visitations carry on, but to hilarious outcomes. Imagine hosting some 400 revelers in groups of a half-dozen or more throughout the course of one particular holiday! Regardless of these pockets of enthusiasm, like all folk customs, Mi-Carême is also struggling to survive in these modern times, and is in competition with house visiting customs like Halloween. Was there anything missing from the book? I would like to have read more about the relationship of Mi-Carême to Les Chandeleurs, where the same troupes circulate among homes on February 2nd, Candlemas, and Mardi Gras (Fat Tuesday). These topics are mentioned in passing (including a terse bibliography on page 68), especially in relationship to their Cajun cousins, but more could have been said. And then there are the mumming customs quite separate from the Acadians, like the German Belsnickling among next door neighbours in Nova Scotia, which could also be added to any discussion about Maritime mummers and their merrymaking. We shall look forward to reading about all of these related customs in Mr. Arsenault's next book. Toronto: New Hogtown Press, 1977, 31pp.